Everyone has heard of the Piña Colada. It is that delicious, tempting rum, pineapple and coconut cocktail that was featured in the 1979 Rupert Holmes's Piña Colada song "Escape". 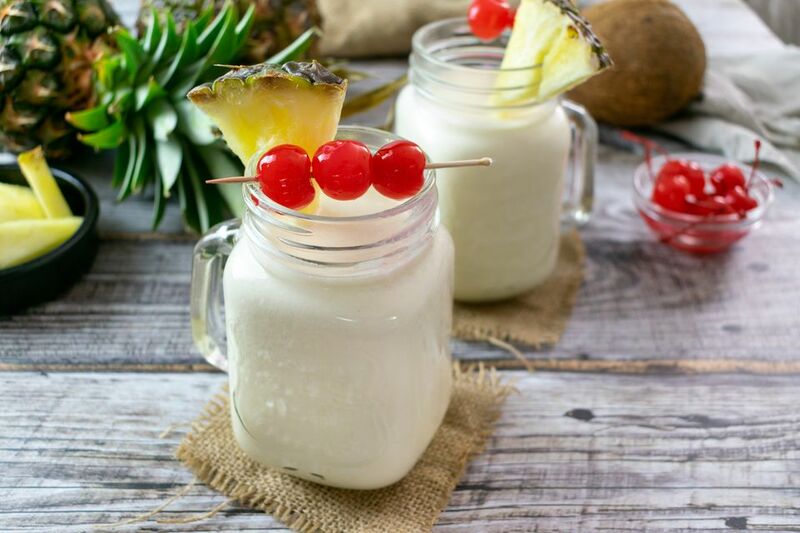 This is one of the most popular tropical cocktails and, even though you can buy a ready-to-drink Piña Colada mix, this fresh recipe makes a much better drink and it is actually very easy. All you need are three common ingredients, a cocktail shaker, and some ice and you got it! This shaken Piña Colada is a more recent adaptation of the original Frozen Piña Colada from the 1950's. Both are excellent rum drinks and which you choose will simply depend on the mood you are in and whether you want to lug out the blender for a drink. Strain into a chilled mason jar, cocktail glass, or collins glass. Garnish with the pineapple wedge and maraschino cherry. Make sure to use the best pineapple juice. We recommend using fresh pineapple juice. Know the difference between cream of coconut or coconut cream. Coconut milk is great in the blended version of a Piña Colada, but not the shaken. However, cream of coconut is the best option for this Piña Colada. It is rich, thicker than the other options and has sugar added. The rum is the only liquor in the Piña Colada and it is important to make a wise choice before you pour. This is a fantastic cocktail that is made even better if it begins with a good base. Step beyond the likes of Bacardi and choose a white rum like Ron Matusalem or Mount Gay. If you want, spend more and don't forget about looking at the options from your local distillery. There are some fantastic rums offered by those small craft distilleries that are spectacular in cocktails like this. Once you learn the taste of a great Piña Colada with white rum and all of these tips, start experimenting. You may want to go with an aged rum or try a flavored rum (either commercial or your own homemade infusion). The possibilities are endless, though I do it's best to get a taste of the original first so you have a foundation to play with. The quality of your pineapple juice is going to make or break your Piña Colada. The best option is, of course, to use fresh pineapple juice. If you do not have a juicer, find the best option available at the store. Dole has long been a favorite brand of pineapple juice. The small 6- to 8-ounce cans are perfect for mixing up a drink or two without opening an entire bottle. If you do have a juicer, the Piña Colada is the perfect excuse to use it! Electric juicers make quick work of juicy fruits like pineapple and the freshness is unparalleled. The average pineapple weighs 2 to 5 pounds and you can count on getting about 6 ounces of juice from each pound. That means that you can get anywhere from 12 to 30 ounces of fresh juice from a single pineapple. Think about how many Piña Coladas you can make with that! Cream of Coconut or Coconut Cream? The various coconut creams available can be confusing. There is coconut milk, coconut cream, and cream of coconut. It is important to know the difference when you want to make a great Piña Colada. Coconut milk has become popular as an alternative to dairy milk though it is too runny for our purposes here. It would a good option in a blended Piña Colada, but not the shaken version. Coconut cream is sold separately and it can also be skimmed off the top of coconut milk (don't worry, the fat that forms on the milk is not a sign of spoilage). Coconut cream has less water in it than coconut milk and would be okay to use in this Piña Colada recipe. Cream of coconut is the best option for this Piña Colada. It is rich, thicker than the other options and has sugar added. We're mixing cocktails, so diet concerns are not a big deal in this case (remember, rum is made from sugar!). The key to making a great Piña Colada in a cocktail shaker is to shake it like you mean it! Give this drink a good, hearty 15 to 20 second shake and allow all of the delicious ingredients to mix together and become one. Shaken pineapple juice will naturally become foamy. When that thick cream of coconut is included in the mix, the drink should come out nice and creamy. Granted, it will not be as thick as the frozen Piña Colada and the ice will add to the dilution, but it should have a nice luscious texture. How Strong Is the Piña Colada? This Piña Colada recipe is equal to the average cocktail. It is not the lightest drink, nor is it the strongest. If an 80 proof rum is used, then the alcohol content is a reasonable 13 percent ABV (26 proof).